A stone lion, a protector from negativity and a talisman against evil spirits, sits in front of the Middle Land Chan Monastery in Pomona, about 30 miles east of downtown Los Angeles. Surrounded by small, single-family, cookie-cutter homes and a stone’s throw away from the 10 Freeway, Middle Land feels far away from the busyness of the city. Beyond hearing birds chirp among a grove of trees or wind rustling the leaves, it’s quiet at the monastery. It’s a place for seekers of peace and tranquility and where I go to contemplate my path through life and make sense of it. In 2012, while I was in between jobs, my mother, a Buddhist and meditation practitioner, invited me to check out Middle Land. She started visiting the monastery in 2010, two years after it was established by Master Wei Chueh, who has founded more than 100 Zen centers across the world. When you first enter, you pass a room on the right decorated with golden Buddha statues where monks teach meditation classes and lead religious ceremonies. The first time I saw the meditation room, it appeared to be lit up, glistening from the yellow mats on the floor. Filled with natural light from the floor-to-ceiling windows and the spicy smell of incense, the place felt welcoming. Since that first visit, I have returned to Middle Land for community events like Thanksgiving, where we do the American holiday with an Asian twist. Think tofu made to taste like chicken with a side of stir-fry noodles and vegan cookies for dessert. The meal is always vegetarian because Zen Buddhists believe they should not take a life, but they celebrate the holiday to respect the customs of the United States. The American tradition of giving thanks is a philosophy that harmonizes well with Buddhism. I also went to the Lunar New Year celebration last February, where families and individuals gathered to make cabbage-mushroom-carrot-tofu dumplings by hand and to share a hot pot of tofu, tomato, corn, and other assorted vegetables at long tables. All the items tasted fresh and light, a healthy alternative to the usual Lunar New Year fare of roasted duck and broiled fish. I prefer to spend the holidays here rather than at a Chinese restaurant: The environment is serene and peaceful compared to noisy eateries filled with callous waiters. These communal gatherings give students a chance to talk to each other about the challenges of staying focused in meditation and how it helps them to cope with difficulties such as losing a family member or adjusting to new jobs. Apart from these gatherings, the attraction that draws me back to the monastery is the free weekly meditation class. I’ve seen how attending the class every week has helped my mom, a librarian at a community college whose patience is tested daily by harried students, professors, and other patrons, become more positive and calm in her daily life. Zen—or Chan, as it is called in Chinese—meditation focuses on turning the eye inward in order to gain insight into the nature of existence. The monks teach techniques that include breath counting and mindfulness of the breath. They speak of the path to enlightenment with an emphasis on self-reflection. 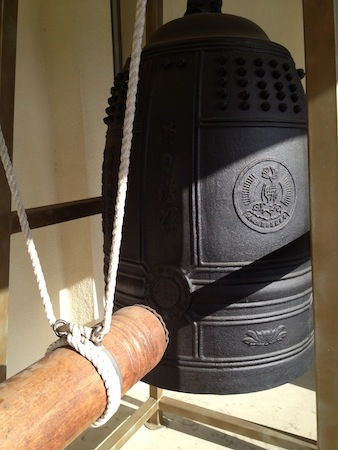 Since its inception, the monastery has welcomed individuals of all belief systems, faiths, and cultures. The name “Middle Land” is a direct translation from Chinese—and the place truly lives up to its name by creating a common ground for meditation in a tranquil environment. 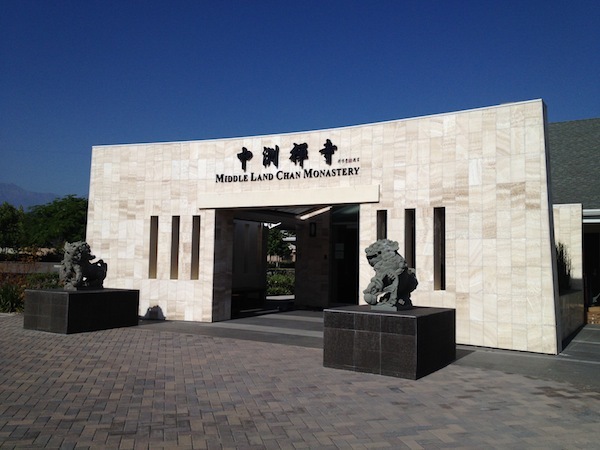 The monks, who hail from Puli Township in Nantou County, Taiwan, teach anyone who walks through the door—and people come from as near as Claremont and Fontana and as far as Malibu. The classes are offered in both English and Mandarin Chinese. My mom and I take the English classes, along with people from a mix of backgrounds. There are college students and retirees. There are Protestants and Catholics looking to incorporate meditation into their daily lives. There are even elementary-school-age kids who come on Sunday afternoons for the crafts and meditation exercises. These young kids have an amazing ability to sit still with good posture—a feat that many adult students grapple with. I’ve found myself drifting back to Middle Land during times of stress. The meditation room feels sacred and sheltered, and it allows me to reflect on my day, ruminate on relationships with friends and family, and work through feelings of pent-up frustration without distraction. When you’re angry, sometimes you can say something that is hurtful or untrue. Meditation helps calm my mind so that I won’t engage in that kind of behavior. The last time I visited the temple a few weeks ago, I felt frazzled. I was rushing from Costa Mesa to downtown Los Angeles in traffic, trying to get to a meeting for a digital media conference I was helping to plan. At the same time, I was frantically trying to find time to finish a story about a society dinner in Costa Mesa and write an in-depth article about a three-generation farming family from Northern California. But, when I arrived at the temple, time seemed to stand still, and I was forced to take a 45-minute break from my phone. I took a deep breath. I just turned 26; my life doesn’t have to be complicated; and I’m lucky that I have certain privileges in the U.S. that other people do not have. The next breath came a lot more easily. Connie K. Ho is a web producer, social media manager, and writer based in Los Angeles and Orange County. You can connect with her on Twitter @conniekho. *Lead image courtesy of Middle Land Chan Monastery. Interior images by Connie K. Ho. Buddhism, meditation, Pomona, religion, stress, Thinking L.A.